Four GCC students are doing more than dream about running a business, they’re doing it! And, thanks to the Harold Grinspoon Foundation Entrepreneurship Initiative Awards, they have some extra cash to help make those businesses succeed. Each year, the Grinspoon Entrepreneurship Initiative Advisory Committee selects student entrepreneurs from several Western Massachusetts colleges to receive financial awards and honors banquet held at the Log Cabin in Holyoke. On April 26, students showcased their businesses and delivered elevator pitches to a panel of business leaders and owners. The Grinspoon Entrepreneurial Spirit Award of $1,200 was presented to Gina Roy, 39, from Greenfield owner of Dustbunnies who offers professional cleaning for offices and businesses. She’s studying at GCC toward a Business Certificate and liberal arts degree. She attended GCC from 1998-2000, taking classes toward a liberal arts degree, then took a break and worked odd jobs to support her family, unsure of what she “wanted to do.” She returned last year seeking a Business Certificate and decided to finish up her degree. Sara Orellana, 39, of Holyoke, makes and sells a spicy chile paste called El Cherufe, named after a mythological creature said to live deep within Chilean volcanoes and cause earthquakes and volcanic eruptions. Lex Rudel, 25, of Brattleboro, is creating a business called Alpine Revolution. Alpine Revolution develops environmentally conscious products for outdoor enthusiasts in an effort to promote a lifestyle where we connect more with the natural world around us. At the Awards Banquet, Lex pitched the company’s flagship technology “Cosmo Threads”—a control system that integrates into any piece of clothing and adds convenience to adventures. Lex has been studying at GCC full-time for two years and plans to get his associates degree in mechanical engineering in 2018. Maya Kazinskas, 38, from Orange owns MJ’s Sweet Sculptures. She creates centerpieces and favors made out of sugar, completely edible, and customized for special occasions. With her award, Maya will expand her business by developing products in the professional grade kitchen at the Franklin County Community Development Corporation’s Food Processing Center. In fall 2016, Maya completed the course work for a certificate Business Management and anticipates earning her associates in Business Management in the spring of 2018. Her immediate plans are to grow the business locally. Her ultimate goal is to develop it into a successful e-commerce business. 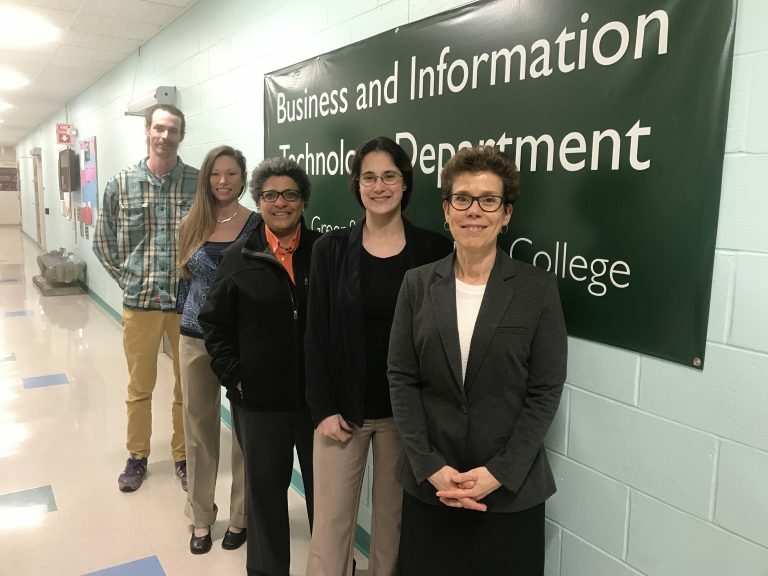 To prepare for the event, students worked with Business Department Professor Michelle Barthelemy and Tina Stevens of GCC’s Business and Art Department. As faculty advisor to the group, Barthelemy brought together people with different skill sets to support the students during the three-month preparatory process. Maya Kazinskas pitched her non-profit organization, Franklin County Against Bullies, at the Banquet’s Elevator Pitch Contest. She worked with Barthelemy and a community business owner on the development and delivery of her pitch. Jim Geisman, founding partner of Software Pricing Partners, provided support to Maya and the other students after meeting them while serving as a judge for GCC’s 2016 Shark Tank competition. In my classes we discuss many of the aspects of building a business: creating marketing plans, identifying target audiences, using media channels, selling online, and brand development. I asked several students from the Digital Design course if they would help the Grinspoon students create digital artwork for their tabletops and brochures. Eliza Mason, Avery Rovatti, Alejo Zaharias agreed to help. We paired up the students who then spent a full Saturday working together in the Art Department computer lab. The designers developed artwork and collaborated with their Grinspoon ‘client.’ It was a great example of a real world scenario where a business person engages a designer to help them create marketing materials. I really appreciate that the design students gave their time for this project. Lex Rudel developed his tabletop and brochure on his own, working with his friend Amanda Killam who is a designer. We met to review and tighten up his concepts for Grinspoon. The Grinspoon students faced a high level of competition at this event. Their success shows they have the skills and determination to take an idea and build it out in areas not previously explored, from concept to business plans, and then tightening it all up to present to the public. By testing themselves and working outside of their comfort zone, I believe they will be able to apply their new skills to anything else they might want to tackle. I know the value of a GCC education and appreciate the role community college plays in opening doors for all students. I graduated from GCC with an Associates in Art with a concentration in Graphic Design in 1976. I went on to become a graphic designer and build a full-service marketing, design, and web development agency. I love that I am now able to be here again, and have the opportunity to share the things I have learned from business experience. The diversity, intelligence, and determination of our students make it a pleasure to be in and out of the classroom with them.